MEXICO CITY, Jun 18 2013 (IPS) - “We can’t sow our fields, which they have rented for next to nothing. What good do we get out of it?” Guadalupe Ramírez complained about wind farms operating in the southern Mexican state of Oaxaca. Ramírez said, “the governments play favourites with big business; our land produces more than what the companies are offering … They said they would come to help us, but that’s a lie,” this 62-year-old Zapotec Indian told IPS when she and other campesinos came to Mexico City from the municipality of Unión Hidalgo, 560 kilometres to the south, to protest the situation. The Piedra Larga I wind farm, which has been operating in the town since October 2012, comprises 145 wind turbines producing 90 MW of power. It is the property of Desarrollos Eólicos Mexicanos (DEMEX), a subsidiary of the Spanish company Renovalia Energy and the private U.S. investment firm First Reserve. In 2007 DEMEX approached local people and began to sign rental contracts with members of the “ejido” or communal land, treating them as if they were independent smallholders and not communal rights holders, and setting an average monthly rental of 20 dollars a hectare. The campesinos of Unión Hidalgo farm between three and four hectares each. But in other municipalities wind energy companies are paying up to 80 dollars a hectare. Moreover, land tenure in Unión Hidalgo is collective, and all decisions pertaining to ejido land have to be made by the entire assembly of the ejido members, so the contracts signed are not actually valid – a fact that at first was not noticed by those who rented out their land. 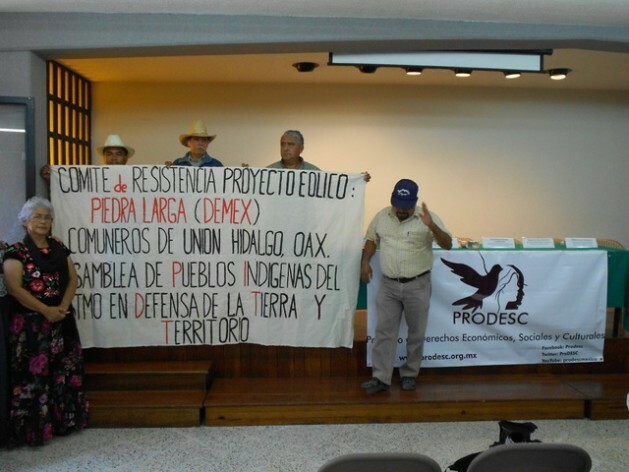 Ejido members farming communal land in the municipality accuse DEMEX of tricking them by not explaining the clauses of contracts that were written in Spanish rather than Zapotec, of not calling the obligatory assembly of the ejido members, of polluting their land and of denying them freedom of movement on their land. In 2014 the company will begin operating the Piedra Larga II wind farm, occupying 300 hectares in Unión Hidalgo, which has a population of 13,970, mainly native Zapotec people. A Resistance Committee against the Wind Farm Project has been created, several of whose members came to the capital to protest on Wednesday Jun. 12. Their protest shows the increasing discontent of Mexican communities with wind energy projects because of their economic, environmental and social consequences. The future of the sector is turning cloudy, just when Global Wind Day was celebrated on Saturday Jun. 15. The energy ministry estimated on Wednesday Jun. 12 that wind energy generates 1,304 MW in Mexico, followed by geothermal power with 812 MW, biomass and biogas with 581 MW and mini-hydropower projects with 450 MW. Without including large hydroelectric power stations, renewable energy sources contribute five percent of the total national energy supply, and the proportion is increasing. The strong winds in the isthmus of Tehuantepec, the narrowest part of Mexico which includes parts of the southern states of Oaxaca, Tabasco, Veracruz and Chiapas, have made it an epicentre for several wind farm projects. Land ownership in this area is primarily collective and communities are governed by traditional custom. To date wind energy exploitation occupies 11,000 hectares nationwide, with investments since 2007 totalling five billion dollars, according to the Mexican Wind Energy Association (AMDEE). The energy reform of 2008 allows individuals and businesses to generate their own electricity from renewable sources, supply it to the national grid and be rewarded with preferential feed-in tariffs. As a result, many companies are buying cheap wind energy to become self-sufficient in energy and reduce their electricity bills. However, critics of this strategy argue that the communities where wind parks are installed have the least to gain. “There is a pattern of human rights violations in the communities. Wind energy companies advertise themselves well, offering money and jobs, but the jobs are temporary. The companies’ actions are not transparent, nor do they meet established standards,” Alejandra Ancheita, the head of Proyecto de Derechos Económicos, Sociales y Culturales (ProDESC – Economic, Social and Cultural Rights Project), told IPS. Following the wind energy boom in Oaxaca, activists fear the negative aspects of the model will be repeated in wind farm projects in other states. “They have brought no benefits. The energy companies violate collective property rights, agrarian laws and the traditional laws of indigenous peoples,” Bettina Cruz, the founder of the Assembly of Indigenous Peoples of the Isthmus of Tehuantepec in Defence of Land and Territory (APIIDTT), told IPS. DEMEX has denied the allegations against it, saying that the contracts are valid and that it has the necessary authorisations for construction and operation of the wind park. “Conditions in the communities have not improved,” said Benjamin Cokelet, head of the Project on Organising, Development, Education and Research (PODER), an NGO for corporate accountability. In his view, the companies may be in violation of international conventions. In the towns of San Dionisio del Mar, Álvaro Obregón and San Vicente, close to Unión Hidalgo, local people have blocked similar wind energy projects through direct protests and legal appeals. For instance, in San Dionisio, the Spanish company Mareña Renovables is planning a 392 MW wind park with 75 million dollars of financing from the Inter-American Development Bank. But the project is at a standstill due to legal action. On Tuesday Jun. 11 the Unión Hidalgo Resistance Committee presented a lawsuit to the agrarian court, which deals with land rights, seeking to invalidate the contracts that have been signed and suspend the working of the wind farm and its expansion, with immediate effect. In April, they presented a complaint to PROFEPA, Mexico’s federal agency for environmental protection, against pollution caused by the wind park. “It’s not right for the government to negotiate with the companies over our land. We have been badly off ever since they arrived. They say it’s clean energy, but that’s not true: lubricating oil from the turbines is contaminating the soil and the groundwater, the blades are killing birds, and the turbines are noisy,” Esteban López, a 55-year-old Zapotec Indian who grows maize and sorghum, told IPS. The three private banks financing the project are signatories to the Equator Principles, a set of voluntary guidelines for assessing social and environmental risk in credits, adhered to by more than 70 international financial institutions since 2003. Cokelet said PODER is considering lodging a grievance under the Equator Principles over irregularities in Unión Hidalgo. “We are not smallholders, we are community farmers with collective tenure, and the company ignored that. They didn’t explain what they were going to do on our land. The contracts are unfair and one-sided,” Ramírez said. By 2020, Mexico expects to generate some 12,000 MW from wind power. Spanish is a colonial language, still being used to deracinate and weaken the indigenous people. In other words, the Mexican govt is still completing the colonialist project begun by Spain. South Africa has 12 official languages, acknowledge many of the main language groups of the country, as well as English. This insidious industry has to be stopped. They provide no net gain for the people of this world. So says the coal industry shill. You know exactly who I am. I can point anybody to the article where I told you. It was about a year ago. You also know that I not connected to anyone except save the eagles international. Spreading lies doesn’t speak well for a wind industry supporter. I am also not a miserable coward hiding behind a false name. repeated with the endangered whooping cranes. like the FloDesign wind turbine.